President Donald Trump has had a troubled relationship with his official jet, complaining early onthat the new version Boeing was working on was too expensive and threatening to cancel the contract. But his latest displeasure is with the aesthetic of the plane that doubles as a residence and command center in the sky. 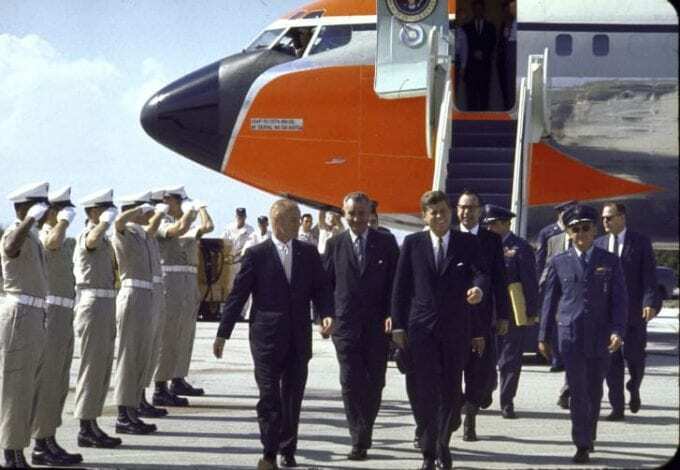 According to Axios, President Trump wants to get rid of the iconic livery that has graced the Air Force One fleet or decades, complaining that the ‘luminous ultramarine blue’ is a “Jackie Kennedy color.” Axios reports the President would rather have a “more American” look. During Jackie Kennedy’s time as first lady, she earned the admiration of millions around the world for her grace, elegance, and style. She inspired a revival of design in the White House and abroad. But the livery of Air Force One was actually created by someone with a greater design legacy: the father of industrial design Raymond Loewy. Loewy was an American designer, born in Paris, and famous around the world for a range of industrial designs and logos ranging from Coca Cola machines to the Exxon logo and even to the iconography of the U.S. Postal Service. His early design career started when he emigrated to New York in 1919, after completing his military service in the engineering corps during World War I. Loewy’s illustrations appeared in Vogue and Harper’s Bazaar. He also worked on window displays for Saks Fifth Avenue and Macy’s. Loewy’s massive body of work earned him a place on the cover of TIME magazine in October 31, 1949, surrounded by many of his creations, including planes, trains and automobiles. He also appeared on the cover of the New Yorker shown in his design office with a number of his enduring logos. Loewy had a very grounded and practical design philosophy, favoring a functional, clean beauty over garish decoration. “Good design keeps the user happy, the manufacturer in the black and the aesthete unoffended,” he said. Loewy also had a passion for aerospace, helping NASA by developing over 3,000 designs for the space program. He worked on the Air Force One project at the request of President John F. Kennedy and donated the work in the service of the nation. President Kennedy selected the design in blue and specified that the letters for ‘The United States of America’ should be similar to the lettering on the heading on the Declaration of Independence. His original design concept for the Presidential plane, which is in the collection at the New York Museum of Modern Art (MoMa), was for a Boeing 707 aircraft which entered service in 1962. The 747 model which flies as Air Force One today did not have its first flight until 1969, and the first VC-25s—747s that are specially modified to meet the security and communications needs for the President— were introduced during the administration of President George H. W. Bush. But, even though the aircraft changed in the years after Kennedy, Loewy’s iconic livery has been constant, an easily recognized symbol of the U.S. around the world. One of Loewy’s initial drawings, at MoMa , shows a red stripe to complement the luminous ultramarine. President Trump can simply go back to the drawing board and re-introduce Loewy’s red white and blue color scheme, respecting the livery’s legacy while making himself happy. If he decided to try something radically new, it wouldn’t be the first time that an American livery abandoned a world-famous designer. American Airlines got a lot of flack in 2013 for ditching the eagle logo and livery design by Massimo Vignelli which had served the airline since 1967, and replacing it with a new logo and livery by Futurebrand. Most have now made their peace with the new look. Of course, the presidential plane is more symbolic than any commercial airline.